Following parliamentary elections on the October 6, a record number - 31 - of the 100 seats in Saeima will go to women, which is above the EU average (30.4%) and well above the average in the rest of the world's parliaments (23.6%). Newly elected women agree - having more women will create a better balance in the parliament, though there is still some way to go before the situation in the country as a whole, where women outnumber men, is reflected more accurately in the corridors of power. 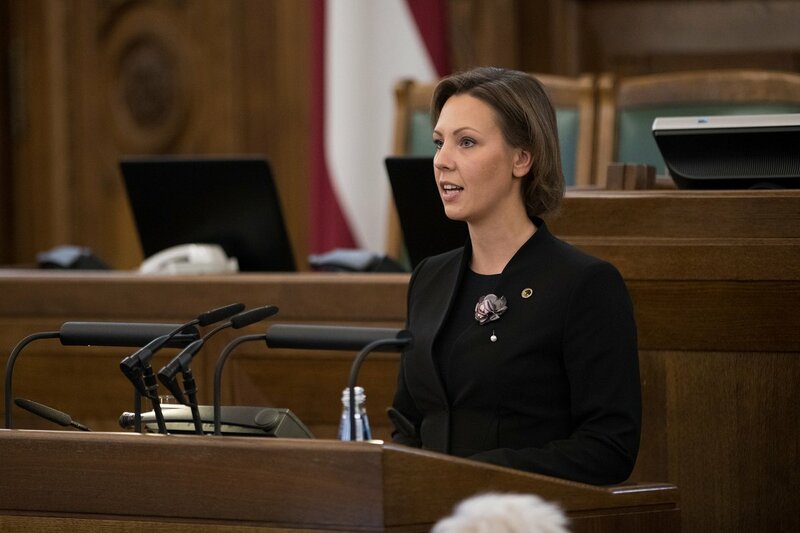 Nevertheless, the number of women holding a seat in the parliament has experienced a significant increase when compared with the 19 seats held by women in the 12th Saeima. Iveta Kažoka who is the director and senior policy expert of Latvia-based think-tank Providus told LSM "Women are more visible within parties with higher levels of internal democracy". She sees the new results as a good thing: "It indicates that Latvian politics is becoming more open and that there will be less čomu būšanas" - a phrase hard to translate but something like a boys-only club. 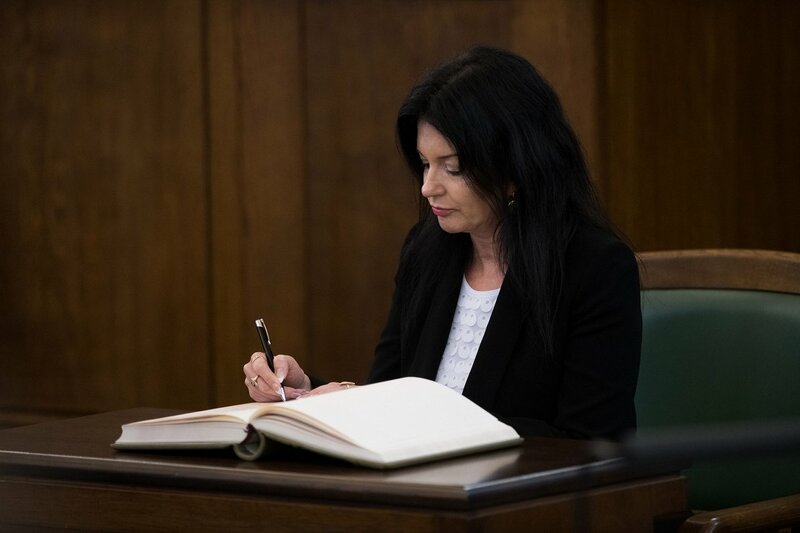 She also believes that with time "representation of women will not only increase in Saeima, but also among prime minister candidates and among the decision makers of the new government." Meanwhile it is worth recalling that unlike some countries, Latvia has already had a female President and Prime Minister. There are seven parties represented in the 13th Saeima as opposed to 6 parties in the 12th Saeima, and three of the parties - KPV LV, New Conservatives, For Development/For! - are completely new and expected to form the core of the new government. All have prominent women among their ranks who have been elected from different regions of Latvia. "In our society there is a dominat image of a male politician. Men are considered to be strong, confident, professional, with logical thinking," explains Ramona Petraviča, who just got elected on the KPV LV ticket. The newly elected MP says her family was well aware that when she got into politics, she "would no longer belong to herself or her family", because in politics "there is only work, responsibility and an obligation". Petraviča has experienced that women, including herself, are often rated by their looks, not their knowledge. "Firstly, women are seen as homeworkers, children's educators. This is a stereotype that is not easy to break," she says. Nevertheless, she feels ready to face the challenge, because, as she notes, her children have grown up and therefore she can devote herself to political work completely. A slightly different opinion is expressed by Dace Rukšāne, a well-known writer, who just got elected as part of the For Development/For! alliance. "Even though Latvia is quite conservative, which we can see in our election results where conservative policy dominates, I have a feeling that in context of gender equality we're heading towards Western values," Rukšāne says. She still vividly remembers her youth "when instead of choosing higher education many encouraged me to make a family and to have children, assuming that that's what a woman's role should be." At the same time, Rukšāne thinks there's still a lot to do to reach higher levels of equality. "Women in Latvia are still discriminated against in terms of salary, because low-paid professions are predominantly occupied by women," she says. "Never did I imagine that politics would't be suitable for women," states Anita Muižniece, another new member of parliament from the New Conservatives. "Around the world, the number of women involved in politics is increasing every year, and from the beginning of time we have witnessed many strong women - stateswomen, leaders and inspirational influencers," she adds. Muižniece doesn't think that Latvian society is particularly discriminatory, but says she's experienced situations where someone says her "place is at home next to the stove and with my children." She believes it's "very important to get out of these stereotypes about what we consider the role of men and women and about their role at work or in the family." In the new Saeima, Rukšāne from For Development/For! wants parliamentarians to focus more on certain issues of which, in her opinion, women often have a better understanding. "Larger representation (of women) will focus more attention on social issues, eliminating inequalities and on taking care of the most vulnerable people in society," she says. Meanwhile Petraviča and Muižniece both believe that men and women will create better balance in the parliament over all. "Women are more emotional, careful, with a high sense of responsibility. Those are the factors that could influence our decision making process," says Petraviča from KPV LV. Muižniece from the New Conservatives points out: "If we look at our country's previous leaders, [former President] Vaira Vīķe-Freiberga is undeniably one of the most outstanding personalities, one of the few who not only stood firmly for Latvia, but who was also able to inspire and encourage." The politician thinks that, even though men and women are different, "both have their own strong characteristics, therefore in politics these opinions, beliefs and approaches on various issues must be balanced." The outgoing Minister of Health Anda Čakša is an example to other women politicians. She has had three kids and made a successful career as a senior politician with one of the toughest jobs in government at the same time. "I don't think that in Latvian society, especially after Vaira Vīķe Freiberga, Sandra Kalniete, Solvita Āboliņa and, of course, Dana Reizniece-Ozola, there is a serious prejudice that 'politics is not women's work'." says Čakša. She believes that women "can perform in much more complicated, physically and psychologically heavy, 'dirtier' jobs - for example, working the field of medicine". The minister of health also notes that "in terms of gender equality, the views of Latvian society are quite harmonised". Čakša thinks that it might be explained not only by the legacy of former Soviet gender equality policies, but also by the Latvian way of life, where historically men have taken care of the fields, horses, forests and women of livestock, barns, and handicrafts which "were equally necessary and valuable". The minister believes that "interaction between women and men makes politics more harmonious". She believes that any male dominated group "tends to be boyish, unilateral, unnecessarily aggressive" and that 31 deputies in the new Saeima "is far from a successful outcome". At the same time, the minister notes that "a female politician inevitably needs to invest more in her image" and "sometimes there are situations when time is simply stolen from family". Nevertheless, Čakša encourages other women to get involved in politics: "Both politics and family is about teamwork - things are much simpler when there's a trustworthy shoulder to count on". The 31% figure puts Latvia ahead of fellow Baltic states Estonia and Lithuania and the European Union average (29.7%) when it comes to the proportion of women sitting in national parliaments. 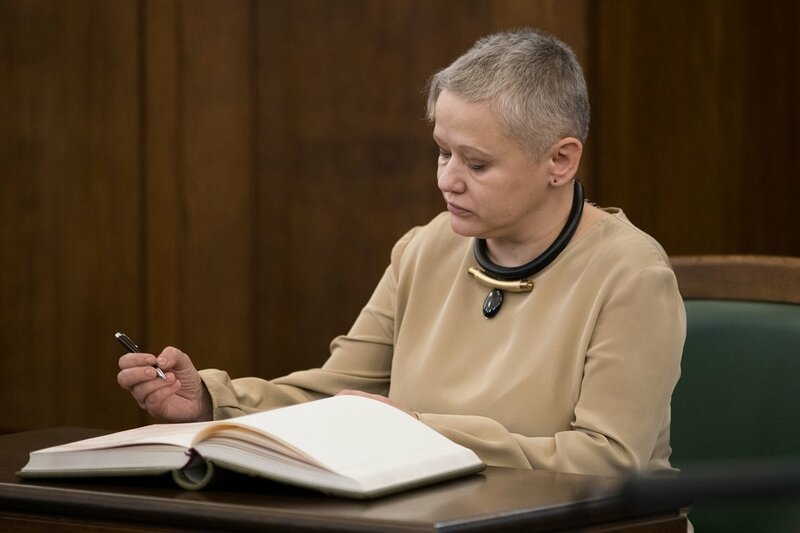 And within the last week Ināra Mūrniece from the National Alliance was chosen by Saeima to serve a second consecutive term as the chairwoman of the Saeima - effectively the speaker of the house - an important position as the chairperson of the Saeima also acts as the interim president should he or she be abroad or sick. 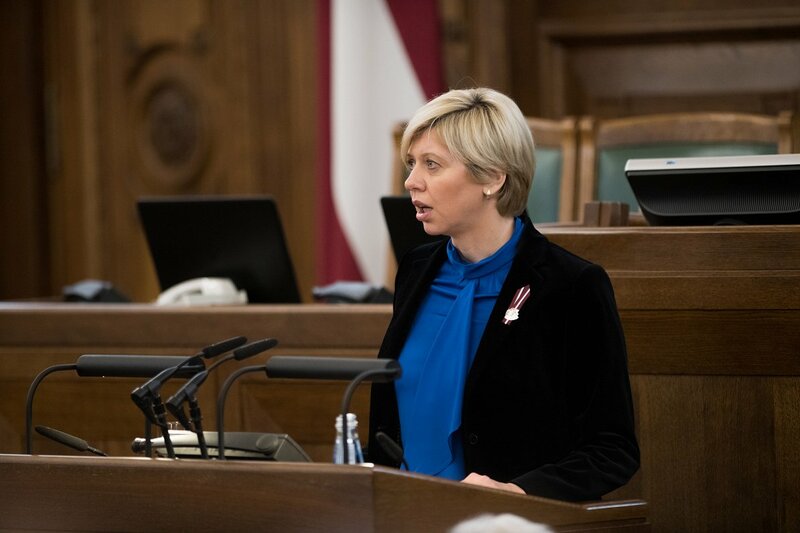 Her four colleagues on the Saeima presidium which organizes the business of the parliament include three other women (Dagmāra Beitnere-Le Galla from the New Conservatives, Inese Lībiņa-Egnere from New Unity and Marija Golubeva of For Development/For!. The only male member of the Saeima presidium is Andrejs Klementjevs of the Harmony party. His job? Secretary.